Can I afford a break and then restart the campaign again after a holiday? What happens if I miss the start of the season or the start of the first or second half? In the articles Judging the Risk of a Football Betting Portfolio and Finding a System Using the HO/AO Quotient (and many other articles), I have always referred to portfolios that span a whole season. Does System Betting Require Betting over a Whole Season? As long as you play with a mathematical advantage on your side, you can start your betting venture at any point throughout the year/season. You can take one or more breaks at anytime and you can re-start again at anytime. The only requirement is that your portfolio must be inherently mathematically sound. One problem you may think of when starting a betting campaign in the middle of a season is that there will already have been a good number of matches played. You may believe that the number of potential winning candidates has been already reduced dramatically. But bear in mind that so has the number of losers. I’m going to show you how the portfolio of bets showcased in the article 2017-18 Winter League Report – 35k in 138 Days would have performed if betting would have commenced and ceased at random times during the season. 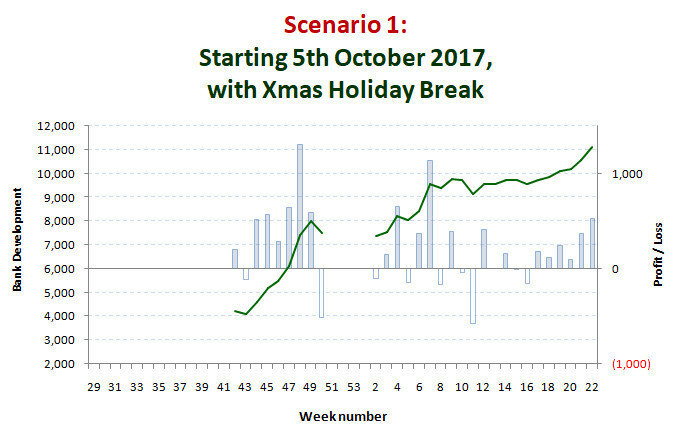 Random Scenario 1 Start Date: 5th October 2017, incorporating Christmas holiday break from say 15th December 2017 to 10th January 2018. 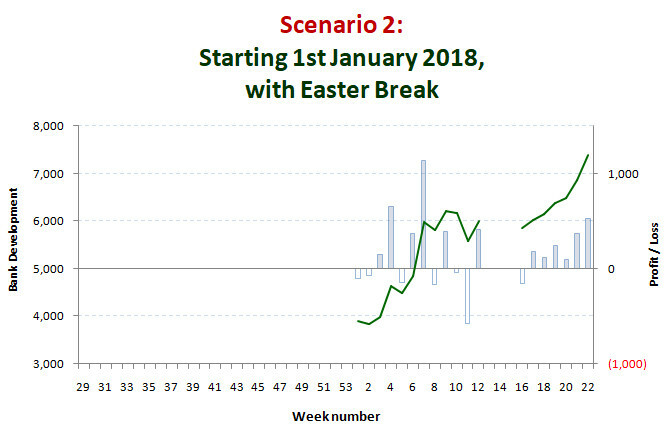 Random Scenario 2 Start Date : 1st January 2018 (second half of season start date for many leagues), incorporating Easter holiday break from say 26th March 2018 to 13th April 2018. Random Scenario 3: Start Date: 1st December 2017, until 1st May 2018 without any breaks. 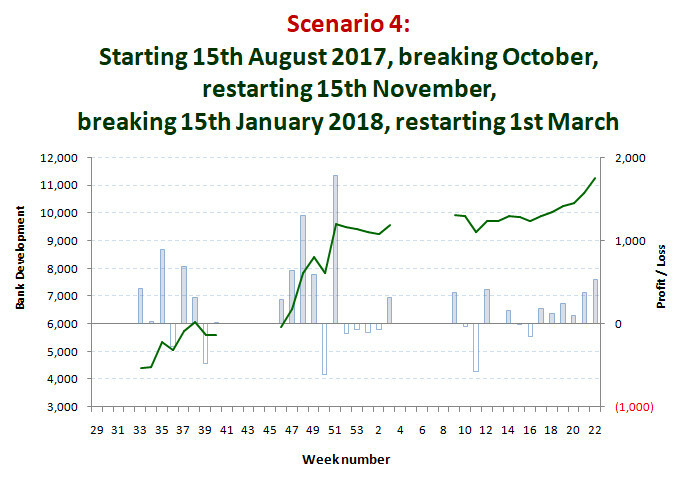 Random Scenario 4: Start Date: 15th August 2017; breaking on 1st October 2017; re-starting on 10th November 2017; breaking 15th January 2018; re-starting 1st March 2018. Please remember that all scenarios relate to the SAME portfolio; our 2017-18 winter league season portfolio example (using the first 10 European League HDAFU Tables in alphabetical order). The chosen scenarios are all random and the point that I will illustrate is that so long as there is a sound portfolio in place, it doesn’t matter when you start betting or if you decide to pause, whether for a few weeks or even months. In order to make direct comparisons, the following analyses are all based on 100 unit flat stakes across the board without ratcheting. Scenario 1 a late start; an example perhaps where the bettor decided to paper-test his/her system for two months before committing money to it. And then, like most people, took time off over Christmas before recommencing. With this campaign, there would have been 95 days of betting with 364 bets placed; the average winnings would have been 74.76 units per betting day, averaging a respectable win of 19.51 units per bet (100 unit flat stakes). Scenario 2 another late start. Perhaps someone who felt more comfortable with a longer period of paper testing? And this time, a holiday break for Easter. Here, there would have been 55 days of betting with 195 bets placed; the average winnings would have been 61.60 units per betting day, averaging a decent win of 17.37 units per bet (100 unit flat stakes). 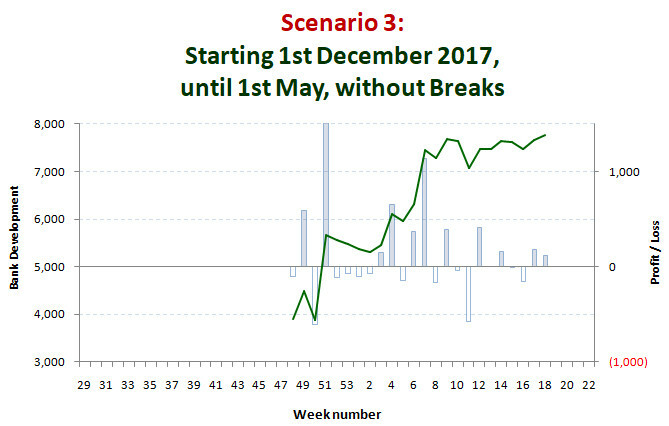 Scenario 3 a five month continuous run without any breaks. During this time scale there would have been 74 days of betting with 265 bets placed; the average winnings would have been 51.05 units per betting day, averaging a very acceptable 14.26 units per bet (100 unit flat stakes). Scenario 4 is a much more random pattern of betting – someone who dips in and out whenever they have time or money, or whenever they feel like it. Sometimes, there are just better things to do in life! During the scattered times there would have been 87 days of betting with 349 bets placed; the average winnings would have been 98.75 units per betting day, averaging 20.79 units per bet (100 unit flat stakes). So, the main lesson you should have learned from this summary is that IF you have compiled a sound portfolio of bets then it really doesn’t matter at what time you start during the season, or when you take a break. How do I Compile my Portfolio if I only start in the Middle of the Season? Compile your portfolio in the same way you would when looking to begin betting at the start of the season/year. For example, if you buy HDAFU Tables in October, you will still need to compile your portfolio as if you would have started at the beginning of the season (July/August). The beauty of starting late is that you can even paper-test your portfolio and check if it is working. If you find that it is then you can safely assume that it will work for the remainder of the season too. If not, then adjust until you get it right. Compile it the same way as advised in various articles and comply with the ‘magic number’. Once you have compiled your full year/season portfolio and you are happy with it then you can start straight away, at anytime of the year. Period. As always I wish you good luck with your betting adventures! I hope this article has cleared up any confusion about starting in the middle of a season, breaking for holidays, and so on… However, if you are still not sure, then please feel free to ask any questions via the comment section below.